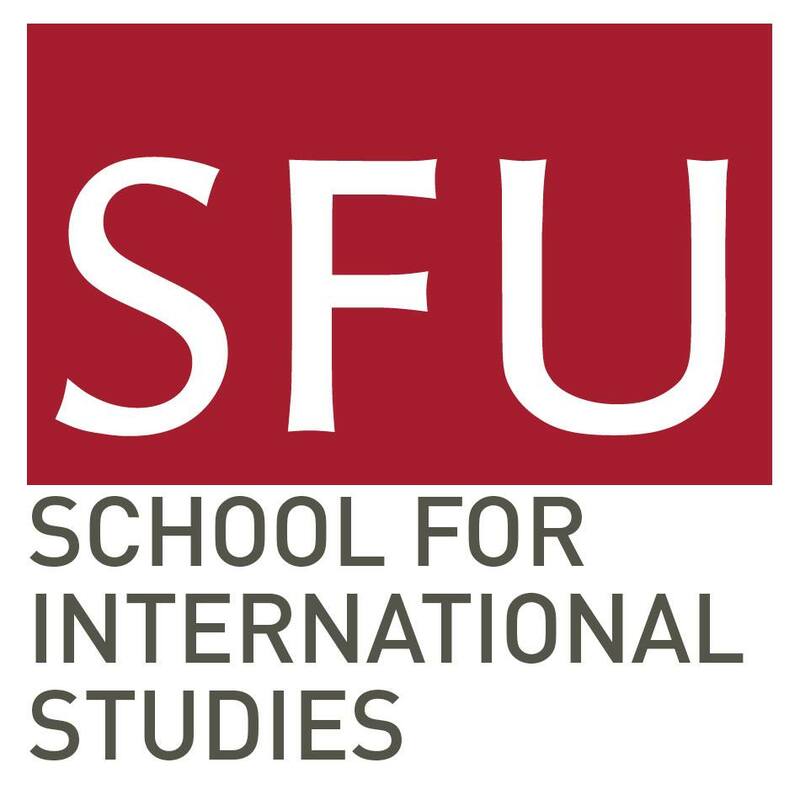 A previous Assistant Professor of Dhaka University, a Fulbright scholar and holds a Master of Political Science from University of British Columbia. 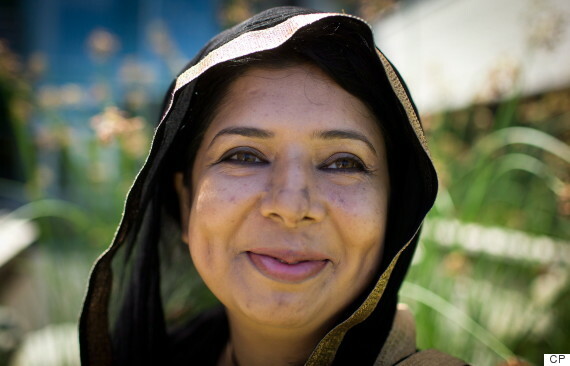 In June 2011, she was brutally attacked and blinded by her husband at the time during a visit to her home country Bangladesh. She is now an advocate of women’s rights. 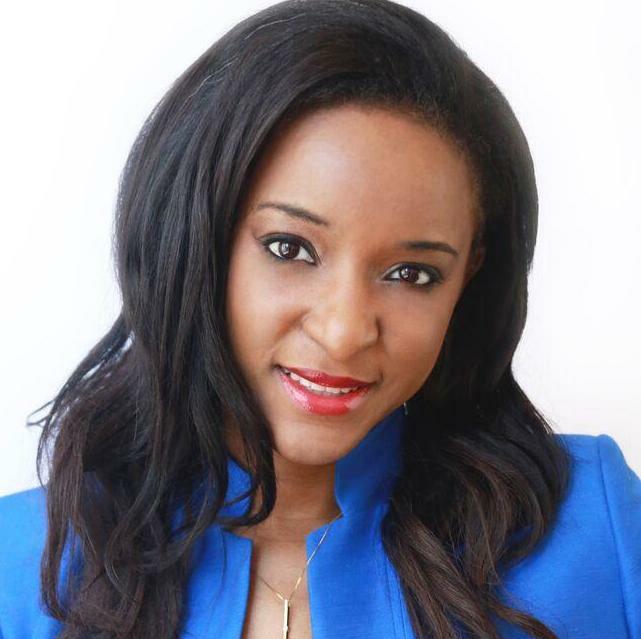 A successful businesswoman working to empower women both economically and socially, Danielle is the founder of Greyfire Impact. She works together with companies and government to integrate forward-thinking initiatives, technology, and social change in developing countries. 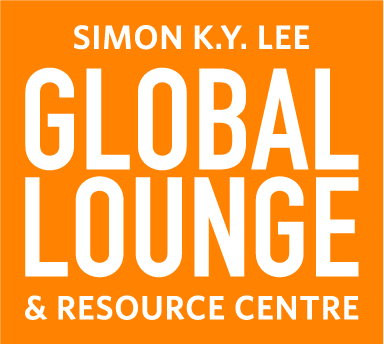 Director of the BC and Yukon division of Futurpreneur Canada. 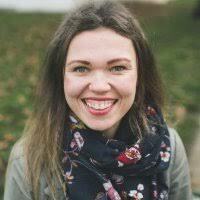 The founder of Young Women in Business, she serves on the Government of Canada’s Expert Panel on Youth Employment. Paulina won an Alliance for Women’s Top 100 International Women Award and the inaugural Wendy McDonald award from the Vancouver Board of Trade. What is International Development Week? International Development Week (IDW) is an initiative established by the Government of Canada to inspire and engage Canadians to learn more about and actively contribute to tackling global challenges. 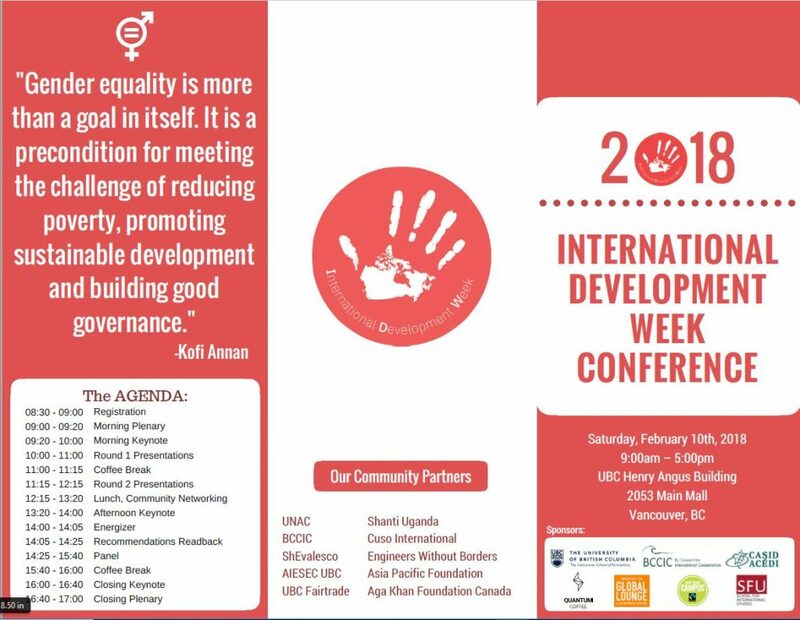 Coinciding with IDW proper, the International Development Week Conference hosted in Vancouver on Saturday, February 10, 2018, will be a jam-packed day of dialogue and participation that will connect and engage conference delegates with community leaders and global changemakers. IDW Conference 2018 will engage the broader community in a conversation about Canada’s role and contribution in humanitarianism, while showcasing local and global initiatives around the country. Additionally, it will also be a platform for participants to network with other passionate industry changemakers, and to get involved in projects and tackling issues they are passionate about. 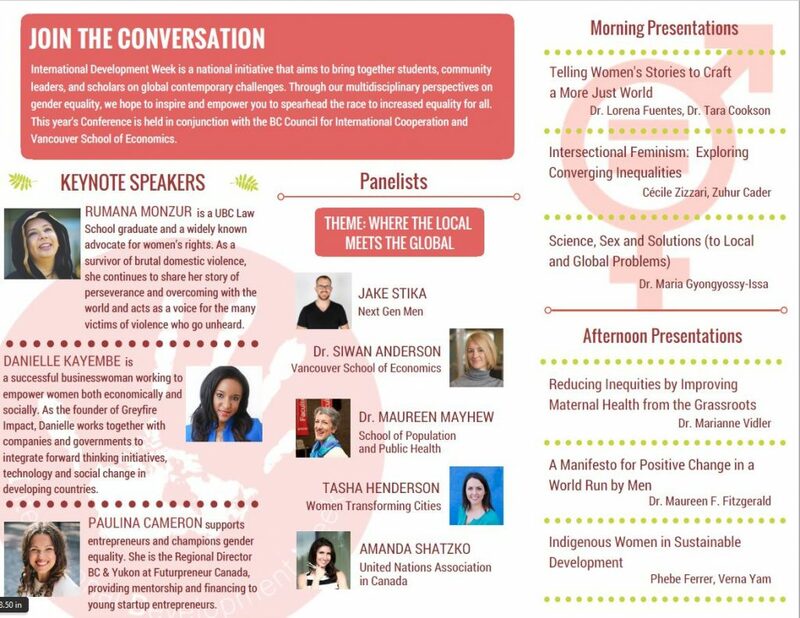 A diverse panel of speakers and experts will engage and impact community members, industry leaders, local changemakers, and scholars in a global conversation about gender equality. Delegates can participate in a collective learning experience about gender equality, while discovering ways and opportunities to take action for positive change. Through networking with changemakers at the event, and discovering new opportunities to engage in community-based research, collaborations, and project initiatives, delegates can further their engagement and learning well beyond the conference itself. The IDW Conference 2018 will conclude with a plenary, in which a series of recommendations will be drafted and documented, to be potentially sent to the Canadian government body as policy recommendations. We invite you to be a part of this dialogue! Speakers and delegates will explore the keystone theme of Gender and Development: Reducing Inequalities and Fostering Inclusive Growth. The conference aims to engage Canadians in a dialogue around United Nation’s Sustainable Development Goal 5: Gender Equality. Gender is not only intertwined with moral and social issues, but economic ones as well. According to a 2017 report by the McKinsey Global Institute, $150 billion could be added to Canada’s GDP through the advancement of women’s equality. As such, the Government of Canada has made gender equality and the empowerment of women and girls a priority, in order to challenge poverty and inequality. Although Canada is among the global leaders in women’s equality, progress towards gender parity has plateaued. Continued work is needed to break the barriers women face in Canada and around the world – and IDW 2018 aims to help provide a foundation for that work. Registration for the Conference is open to all. Cost of a ticket is $10 and all sales are used to fund the conference.